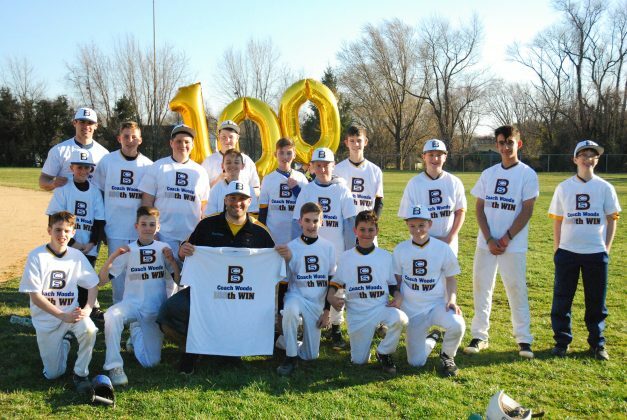 The BCS Baseball team celebrated head coach Brent Woods’ 100th career victory with t-shirts in his honor. Pictured, left to right, is Marc Perkins, Patrick Karbach, Coach Woods, Ryder Haldeman, Dylan Marini and Robert Bickerdyke in the front row. In the back is Coach Meo, Anthony Silvestro, Danny Fean, Blake Buchinsky, Kyle Cureau, James Knight, Spencer Haldeman, Zachary Holland, Connor Von der Tann, Kyle Swanholm, Donald Kehoe, Evan Drucis. 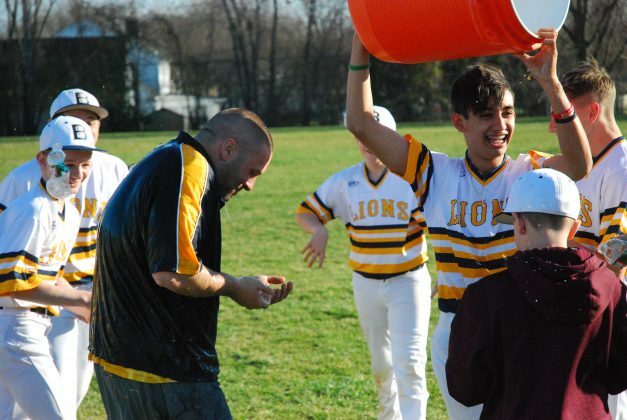 Berlin Community School Baseball head coach Brent Woods, after earning his 100th career win at BCS, has Gatorade dumped on him by eighth grader Donald Kehoe. After a 12-1 win over Gibbsboro, Berlin Community School continued its undefeated start to the season with a 5-0 record. Although it was a win in the beginning of April during the early portion of the regular season, celebratory Gatorade and water were poured on Berlin Community School baseball coach Brent Woods, as the win over Gibbsboro was No. 100 for Woods at BCS. Woods coached junior varsity baseball at Maple Shade High School for three years prior to landing a full-time teaching job at BCS as an eighth-grade civics teacher. After landing the job and leaving Maple Shade, Woods was just hopeful he would be able to simply “help out” the BCS baseball team. However, Woods received a stroke of luck shortly after coming to BCS. “The stars aligned I guess you could say – they were in need of one and I was looking for the opportunity,” Woods added. Woods wasn’t sure what to expect going into his first season at the helm for BCS baseball in 2012; being a middle school team, he expected to focus on the fundamentals and work the team up from there. Despite it being a small town, he says he’s been blown away by the amount of talent he’s seen from kids over the years and the following parents and the community have given the team. Woods credits his accomplishment of 100 wins heavily on the kids who have played the sport enough to already be at a high level before they get to Woods’ dugout. Former BCS Lion Davis Schneider played under Woods for two years before moving up to Eastern Regional. Schneider says he played mostly shortstop while at BCS, however he now plays third base in minor league affiliates of the Toronto Blue Jays after being drafted in the 28th round in 2017 out of Eastern. Schneider says he thoroughly enjoyed playing baseball under Woods growing up and congratulated his former coach on his achievement. Eighth-grader Donald Kehoe also said one of the best aspects of Woods as a coach, and a teacher, is his happy personality and keeping activities fun. After celebrating career win No. 100 at BCS, Woods is preparing his team to go after another championship, as BCS has been crowned the champion six of the past seven years. Regardless of the accolades, Woods says he is thankful to have landed in a community that supports its student-athletes and sports teams as much as it does. “It couldn’t have worked out much better, I couldn’t ask for a better place to be honestly,” Woods said.